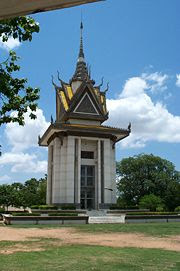 The Killing Fields were a number of sites in Cambodia where large numbers of people were killed and buried by the Communist regime Khmer Rouge, which had ruled the country since 1975. The massacres ended in 1979, when Communist Vietnam invaded the country, which at that time was officially called Democratic Kampuchea, and toppled the Khmer Rouge regime. Estimates of the number of dead range from 1.7 to 2.3 million out of a population of around 7 million. The Khmer Rouge judicial process, for minor or political crimes, began with a warning from the Angkar, the government of Cambodia under the regime. People receiving more than two warnings were sent for "re-education", which meant near-certain death. People were often encouraged to confess to Angkar their "pre-revolutionary lifestyles and crimes" (which usually included some kind of free-market activity, or having had contact with a foreign source, such as a US missionary, or international relief or government agency, or contact with any foreigner or with the outside world at all), being told that Angkar would forgive them and "wipe the slate clean". This meant being taken away to a place such as Tuol Sleng or Choeung Ek for torture and/or execution. The executed were buried in mass graves. In order to save ammunition, executions were often carried out using hammers, axe handles, spades or sharpened bamboo sticks. Some victims were required to dig their own graves; their weakness often meant that they were unable to dig very deep. The soldiers who carried out the executions were mostly young men or women from peasant families. The Khmer Rouge regime arrested and eventually executed almost everyone suspected of connections with the former government or with foreign governments, as well as professionals and intellectuals. Ethnic Vietnamese, ethnic Chams (Muslim Cambodians), Cambodian Christians, and the Buddhist monkhood were the demographic targets of persecution. The best known of the Killing Fields is Choeung Ek. Today, it is the site of a Buddhist memorial to the terror, and Tuol Sleng has a museum commemorating the genocide. A 1984 motion picture, The Killing Fields, tells the story of Cambodian journalist Dith Pran, played by Cambodian actor Haing S. Ngor, and his journey to escape the death camps.